Carrie Fisher was just nineteen years old when she landed the role of Princess Leia in a low-budget space fantasy. It can be hard to remember either of those facts now--either that she was nineteen, or that it was a low-budget movie no one expected to be a hit. Certainly no one expected the kind of hit it became! When she was just barely an adult, and in some ways not very mature for her age, she was suddenly on an international stage. She talks honestly and insightfully about where she was then, how unprepared and uneducated she was (she had dropped out of high school in the eleventh grade), and how it affected her. She's honest about her mistakes, though she has also reached the point in life where you know it's pointless to be too hard on yourself. She also talks about the later years, not in great detail overall, but about learning to be such a public person, and her interactions with the fans. She's wry and funny and ultimately kind there, too. It's not a long book, just a bit over five hours in the audio version, but it's fun, and moving, and enlightening. 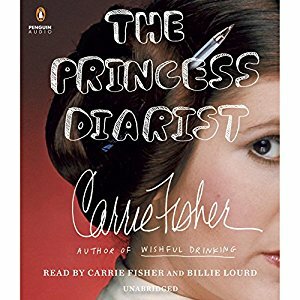 I found a lot to connect with, here, and I treasure the fact that it is Carrie Fisher's own voice. 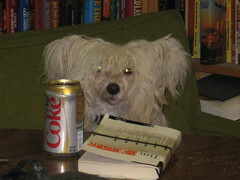 With a very sweet, loving, devoted small dog of my own, I'd have loved to hear her talk more about her French bulldog, Gary, but that would have been way, way off topic for the focus of this book.